First, a little history. Pete, at age 11, went on a 50 mile backpacking trip through Yosemite National Park. It whet his appetite for travel and the outdoors and for the beauty of the United States. Pete met Ellen in San Luis Obispo in 1973. At this time Pete owned a 175cc Honda street motorcycle. Pete, Ellen and good friend Roger used to head out after work during the summer and travel many of the rural roads of San Luis Obispo county. This whet their appetite for motorcycle travel. Soon Ellen got her own Honda 125cc dual-sport motorcycle. Neither of these two motorcycles are meant for long distance travel. But that didn't stop them from packing their camping gear and heading up Highway 1 for a 107 mile trip to Big Sur. Ellen on her 125 and Pete on the "big" 175 with the camping gear. A great time was had meeting up with friends Tim and Stephanie. As Pete and Ellen grew up, so did their motorcycle. In 1975 they purchased a Honda 550 Super Sport road bike. That year their two week vacation was a motorcycle camping trip along with their dog Smokey who road in a laundry basket strapped to the gas tank. This 900 mile trip included stays at friend's houses, motels, campgrounds and wilderness hiking. Pete, Ellen, motorcycle and a dog. Do you see where this going? In 1976 Pete and Ellen bought their new Ford cargo van which Pete converted into a camper. They used the van for many trips mostly for motorcycle trials events. One notable trip was to watch the Motorcycle Trials Nationals at Donner Ski Ranch. In addition to their two-year old son John, they packed four motorcycles in and on the van and were accompanied by friends Colly, Wally and Aaron. The camping bug grows. As the Mattson family grew so did the need for a larger RV. Between 1976 and 1996 there were more trips but the van was getting crowded. Twice they rented motorhomes. One a 30 foot class C, the other a 35 foot gas class A motorhome. Now the itch for an RV needed scratching. In 1998 Pete and Ellen bought a used 34 foot 5th wheel with no slides, no generator and no frills. Of their many trips, two are notable. First, during the winter, a trip to Mammoth Mountain Ski Area. Mom, pop and five kids who all loved the snow. Left at 10 pm and by the time they arrived at Mammoth it was raining and winds were at 60 mph. In their three days there the ski resort was never open. 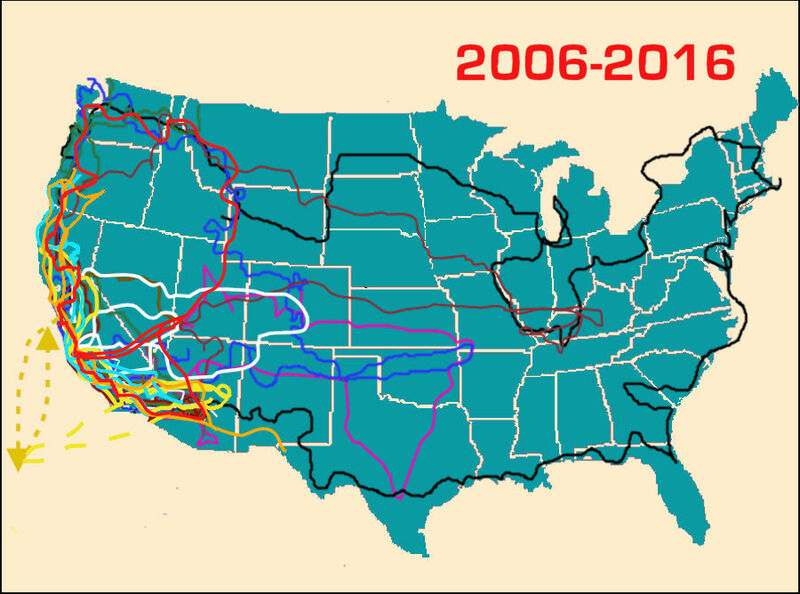 The next big trip was 25 days to seven western states with Emily and Melissa. This trip was a big success until the 5th wheel caught fire on the last night. Enter 2006 stage left. We purchased the 40 foot MotherShip and headed out for a little fun and seeing the nation. We did not know that we were a full time motorhome living couple, but we are! It has been 11 years with no end in sight. The map of our travels is below. We know it looks like a 3 year old's coloring page, but we did stay inside the borders, almost! Obviously we have finished coloring California. Northern Nevada, Southwest Oregon, Southeast Idaho need a few strokes. And the East Coast is waiting for more attention. That's okay, there are plenty of years left. P.S. The 5th wheel fire was small and inside a wall. However, the San Jose city fire department sent out a captain, a water truck, another vehicle and six firemen. We shouldv'e gotten pictures!